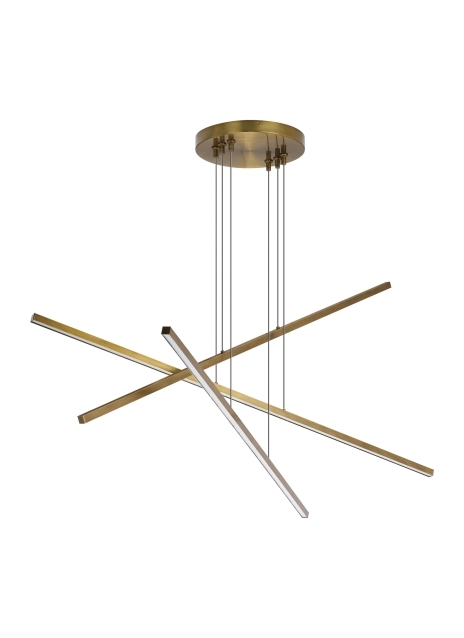 The ultimate in modern minimalism, the Essence Trio by Tech Lighting has three streamlined, linear lengths which are staggered randomly to create this dramatic and oversized modern interpretation of a chandelier. Linear LEDs lights create a warm, downward light glow with the lighting fixture's high performance, energy efficient, integrated LED light source at 3000K and 90 CRI. Ideal for lighting a dining room table, kitchen island or a conference room table, Essence is available in either an Aged Brass finish with Bronze cable or Satin Nickel finish with Clear cable. Its dimensions are 17.8" high and 50" long. Each of the three linear lights are only .75" thick and 7.5" wide. Damp-rated and dimmable. Includes (3) integrated 120 volt 20 watt, 4320 total delivered lumens 90 CRI 3000K LED modules. Dimmable with most LED compatible ELV and TRIAC dimmers. Includes 10 feet of field-cuttable cable.